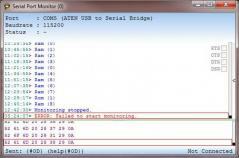 Serial Port Monitor is a simple and useful tool that can monitor serial ports, show their status and store event logs. From the right-hand menu you can quickly start or stop the program, but also view an activity graph in hex or decimal system. The same menu allows you to enable several filters, which let you set Serial Port Monitor to ignore details regarding certain data, empty lines or duplicated messages. From the main window, it is possible to select the hardware flow control between DTR, DSR, RTS and CTS. Also you will need to choose which port should be monitored, the data size and the Baud rate.